In 2005 the production was high but with small berries that have concentrated the tannins and colour. Overripe and dry grapes were taken out to reassure the finesse of the wine. 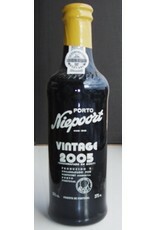 Vinha da Pisca (very old vineyard) with notes of coffee and black berries gave the final blend the desired freshness. Fermentation took place in lagares after foot treading. Aged two years in big cask, bottled in july 2007. Fine, elegant, mineral but not balsamic, the floral and fruity character are enhanced. The taste continues fine, although it's a tannic wine. Rich but not excessive and with a long spicy aftertaste. Impressive finesse even though robust. Perfect with “Queijo da Serra”, a Stilton or other blue cheeses. Egg based desserts with “Pão de Ló” (Portuguese sponge based cake). Pure chocolate bonbon with a filling of port, almonds and fleur de sel. Pure chocolate with a filling of port, almonds and fleur de sel.